IMS™ High Availability Large Database Toolkit (HALDB) for z/OS® helps convert existing IMS Full Function databases into IMS HALDB databases. It allows IMS data base administrators (DBA) to simulate changes to partition settings to ensure they are correct before implementation. It also gives DBAs the ability to maintain and tune the HALDB databases. The IMS HALDB Toolkit supports partition consolidation and partition splitting to accommodate growth or shrinkage in an IMS application. 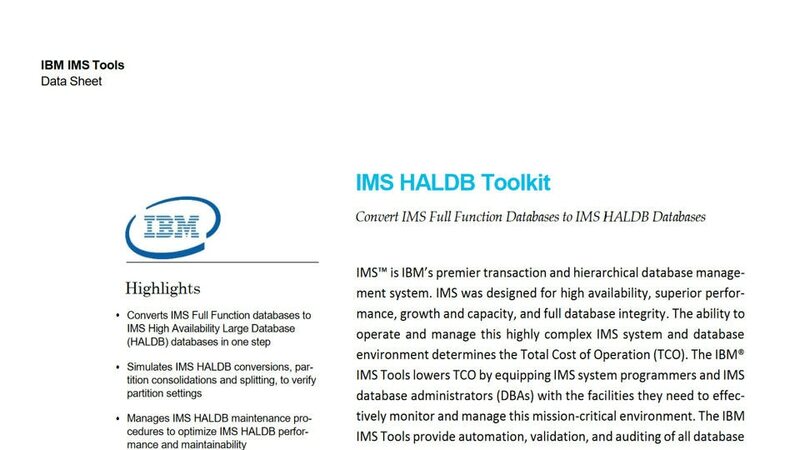 The IMS HALDB Toolkit is fully integrated with other IMS High Performance tooling to provide special capabilities in the management of IMS HALDB databases. IMS HALDB Toolkit for z/OS converts IMS Full Function databases to IMS High Availability Large Database databases in one step. IMS HALDB Toolkit for z/OS provides partition consolidations and splitting to verify partition settings. IMS HALDB Toolkit for z/OS manages IMS HALDB maintenance procedures to optimize IMS HALDB performance and maintainability.